Could cannabis play a role in geriatric, palliative veterinary care? In geriatric practice and palliative medicine, we can see a wide range of medical conditions, often times with multiple ailments co-existing in the same patient. Attempting to treat them all can be exhausting for clients, raises the risk of polypharmacy, and in some cases, results in patients outright refusing treatment. The focus of palliative and hospice care is to achieve the best quality of life possible for the patient and the family. Sometimes, this can be difficult for doctors who are trained so well in what we ‘can do,’ that it can be hard to let go and focus instead on what we ‘should do.’ Part of that goal should include finding ways to best support our patients in a way that also strengthens the human-animal bond and puts the least stress on both parties. In this vein, medical cannabis can hold considerable promise. For millennia, people have used the cannabis plant as a source of medicine, not only for themselves, but for their animals.1 Almost a century of prohibition halted this use and limited the research that would have helped us gain a better scientific understanding of how it works. However, in recent years there has been a resurgence of interest in its medical applications—again, not just for people, but for the animals with whom we share our lives. Considering its wide range of effects on the body, cannabis is a promising treatment for numerous conditions, and as some human patients have reported, can provide relief and sometimes replace a number of conventional therapies. Extrapolating from these reports, cannabis may hold similar promise for animals. The cannabis plant contains more than 400 chemical compounds, including over 100 cannabinoids, 120 terpenes, as well as phenolic compounds, bioflavonoids, and antioxidants. The composition of each plant’s compounds can vary significantly depending on several factors, including the strain, growing conditions, harvest time, drying and curing, and the final processing methods. We are only just beginning to understand how these many compounds work within the body, and how they interact with each other to produce a specific effect. The endocannabinoid system (ECS)—which is found in all vertebrates (as well as some invertebrates)—may well be the largest receptor system in the mammalian body. The two primary cannabinoid receptors, CB1 and CB2, along with the many receptors that work within the ECS, can be found in almost every organ system. CB1 receptors are located primarily in the brain, and when activated by their primary exogenous ligand—tetrahydrocannabinol (THC)—are responsible for the psychoactive effects commonly associated with cannabis use. However, these receptors also are found in muscle, fat, gonad, glandular, gastrointestinal, liver, kidney, and lung tissues. Found primarily within the immune system, CB2 receptors are expressed in the brain, peripheral nervous system, and the gastrointestinal system, and are also activated by THC, along with β-caryophyllene, a terpene found in cannabis. Others such as serotonin (5-HT) receptors, glycine receptors, vanilloid (TRPV) receptors, peroxisome proliferator-activated receptors (PPARs), and G protein-coupled receptors (e.g. GPR18, GPR55, and GPR118) are also directly involved in the ECS through activation by cannabinoids, including cannabidiol (CBD). While Canadian veterinarians are not yet able to legally prescribe, dispense, or recommend most cannabis-based therapies, it is incumbent upon us to have a basic understanding of how cannabis works, and the conditions where it shows the most promise. This is of particular importance considering adult Canadians now have legal access to a range of cannabis products they may choose to give their animals for pain or other medical purposes. While these products are not approved for animal use, we know from experience this has not stopped pet owners, both here and south of the border, from seeking out and administering these treatments to their pets. So let’s now take a look at three diverse, but common conditions we see in geriatric and palliative medicine and explore the science behind the potential effects we could reasonably expect cannabinoid medicine to play. 1) Chronic pain, including pain from osteoarthritis: Chronic pain, and particularly pain from osteoarthritis, is a condition most practitioners deal with on a daily basis among our senior patients. When treatment options are exhausted or become cost- and/or time-prohibitive, unmanageable chronic pain can lead to humane euthanasia of a beloved pet. Current therapeutic options have typically included the use of nutraceuticals, NSAIDs, gabapentin, tramadol, other opioids, amantadine, acupuncture, massage, photomodulation (i.e. laser therapy), and rehabilitation. What makes cannabis so unique to many other treatments is its potential to address arthritic pain through multiple mechanisms, including chondroprotection, anti-inflammatory action, and analgesia. Studies show chondrocytes from osteoarthritic joints were found to express a wide range of cannabinoid receptors even in degenerate tissues, demonstrating these cells could respond to cannabinoids.6 This is an exciting area to watch as further research becomes available. Peripherally, modulation of TRPV1 receptors by CBD and activation of CB2 receptors on immune cells by either THC or β-caryophyllene reduce the release of proinflammatory molecules, thereby lessening the inflammatory response, which is a direct cause of pain. Activation of CB1 decreases the release of excitatory neurotransmitters (glutamate and glycine) in the dorsal horn of the spinal cord. CB2 receptors are upregulated during chronic neuropathic and inflammatory pain, and are blocked by THC. Activation of CB1 receptors in the brain by exogenous THC modulates the emotional processing of pain signals. In other words, cannabinoid therapy can reduce the inflammation triggering a pain response, diminish the signal getting to the brain, and once in the brain, alter the brain’s perception of that pain. 2) Cognitive dysfunction and anxiety: Anxiety in senior pets can be due to many causes, including pain, a reduction in hearing/vision that can make them feel less secure, and cognitive changes. CBD also has been shown to promote neurogenesis in the hippocampus. Human patients with depression or anxiety often have a smaller hippocampus, and successful treatment of depression is associated with the birth of new neurons (neurogenesis) within the hippocampus. Similar changes, if they occur in companion animals, could provide a method to measure changes and assess the therapeutic effects of cannabis treatment. However, the anxiolytic properties extend beyond the terpenes and CBD, as THC facilitates fear extinction and has been shown to aid in post-traumatic stress disorder (PTSD) and similar conditions. 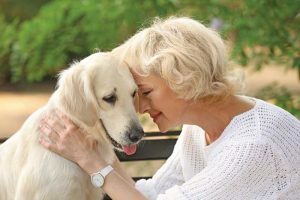 Although we do not yet have studies looking specifically at canine and feline cognitive dysfunction syndrome (CDS) and cannabis use, CDS in dogs has been found to be a reasonable model for human Alzheimer’s disease (AD). Here, the use of cannabis has been shown beneficial in animal models of Alzheimer’s, as well as clinically in people with dementia. Studies using mice as a model for AD show the use of THC/CBD in early stages, as well as in advanced stages, can help reduce symptoms and memory impairment. THCA—the naturally occurring acidic form of THC—is shown to have neuroprotective effects in neurodegenerative/neuroinflammatory diseases. Supporting these findings are the human studies that revealed patients with dementia taking cannabis oil were reported to have reduced delusions, agitation/aggression, irritability, apathy, anorexia, sleep, and caregiver distress. 3) Cancer: Of all conditions discussed, perhaps the one that has attracted the most attention is the use of cannabis in the support and treatment of cancer. Consider this: A PubMed search for ‘cannabinoid cancer’ produces 1541 results. Yet, despite all this research, we are only beginning to scratch the surface on how we can best use cannabis clinically, and in what conditions. Indeed, the research shows various cannabinoids and terpenes can have a direct effect on tumour growth through a multi-targeted approach, as well as providing palliative support for many of the symptoms accompanying both cancer and cancer therapy. Even without targeting a resolution of cancer itself, cannabis has also proven beneficial in reducing some of the symptoms associated with this disease. Through various pathways, compounds found within cannabis can help manage pain, reduce nausea (including chemo-induced nausea), improve appetite, allow improved sleep quality, and reduce anxiety and depression. It is clear there is still much work to be done to further our understanding of ECS, the various compounds found within cannabis, and how they all work together. Given the extensive variation of cannabis product composition and the individual differences in response to cannabinoids, establishing clear dosing guidelines for patients has been difficult. Nonetheless, with the appropriate guidance and dose titration, many human patients have found the use of cannabis to be extremely beneficial for a range of medical conditions. The expectation is that the same will be said of animal patients in the near future. At last count, Health Canada reported there were now more than 330,000 registered human patients under the Access to Cannabis for Medical Purposes Regulations (ACMPR).15 One of the fastest growing demographics of medical cannabis use are baby boomers and those in the 45 to 64 years age group.16 This isn’t too surprising when we consider we tend to develop more health conditions and require more medication as we age. And so it is with our patients, too. As we move forward within our new world of legalized recreational cannabis in Canada, let us not only focus on reducing risks of over-consumption, but also strive to understand more about cannabis as a medicine. Let’s keep our minds open to the possible therapeutic roles it may play in improving our patients’ overall quality of life, and ask ourselves, “If this were my pet facing declining quality of life and possible euthanasia, would I want to try giving them cannabis-based medicine?” Every day we have with our pets is a gift. Perhaps cannabis could help us share more of them. 2 Hammell DC, Zhang LP, Ma F, et al. Transdermal cannabidiol reduces inflammation and pain-related behaviours in a rat model of arthritis. European Journal of Pain (London, England). 2016;20(6):936-948. doi:10.1002/ejp.818. 3 Burston JJ, Sagar DR, Shao P, et al. Cannabinoid CB2 Receptors Regulate Central Sensitization and Pain Responses Associated with Osteoarthritis of the Knee Joint. Price TJ, ed. PLoS ONE. 2013;8(11):e80440. doi:10.1371/journal.pone.0080440. 4 Philpott HT, O’Brien M, McDougall JJ. Attenuation of Early Phase Inflammation by Cannabidiol Prevents Pain and Nerve Damage in Rat Osteoarthritis. Pain. 2017;158(12):2442-2451. doi:10.1097/j.pain.0000000000001052. 5 Gamble L-J, Boesch JM, Frye CW, et al. Pharmacokinetics, Safety, and Clinical Efficacy of Cannabidiol Treatment in Osteoarthritic Dogs. Frontiers in Veterinary Science. 2018;5:165. doi:10.3389/fvets.2018.00165. 6 Dunn SL, Wilkinson JM, Crawford A, Bunning RAD, Le Maitre CL. Expression of Cannabinoid Receptors in Human Osteoarthritic Cartilage: Implications for Future Therapies. Cannabis and Cannabinoid Research. 2016;1(1):3-15. doi:10.1089/can.2015.0001. 7 Ruhaak, Lucia & Felth, Jenny & Christina Karlsson, Pernilla & Rafter, Joseph & Verpoorte, Robert & Bohlin, Lars. (2011). Evaluation of the Cyclooxygenase Inhibiting Effects of Six Major Cannabinoids Isolated from Cannabis Sativa. Biological & Pharmaceutical Bulletin. 34. 774-8. 10.1248/bpb.34.774. Volume 157, 2018, Pages 198-228, ISSN 0223-5234, https://doi.org/10.1.16/j.ejmech.2018.07.076. 11 Watt G, Karl T. In vivo Evidence for Therapeutic Properties of Cannabidiol (CBD) for Alzheimer’s Disease. Frontiers in Pharmacology. 2017;8:20. doi:10.3389/fphar.2017.00020. 12 Velasco G, Sánchez C, Guzmán M. Anticancer Mechanisms of Cannabinoids. Current Oncology. 2016;23(Suppl 2):S23-S32. doi:10.3747/co.23.3080. 14 Yasmin-Karim S, Moreau M, Mueller R, et al. Enhancing the Therapeutic Efficacy of Cancer Treatment With Cannabinoids. Frontiers in Oncology. 2018;8:114. doi:10.3389/fonc.2018.00114. Sarah Silcox, DVM, CVA, CVSMT, is a founding director and current president of the Canadian Association of Veterinary Cannabinoid Medicine (CAVCM), a national non-profit corporation founded by a group of veterinary professionals. Its core objectives are to help guide legislative changes to ensure veterinarians have fair access to appropriate cannabis products for veterinary medical use; collaborate with groups conducting species-specific cannabis-based studies on the safety, dosing, and indications of cannabinoid veterinary medicine; and collect, evaluate, and disseminate information surrounding the appropriate use of medical cannabis in veterinary patients through education of veterinary professionals and general public. Dr. Silcox can be reached via e-mail at sarah.cavcm@gmail.com. For more about the association, e-mail info.cavcm@gmail.com.